In July 2006, Fidel Castro passed power to his younger brother and defense minister Raúl Castro and a team of other ministers on a provisional basis. Since then, the U.S.-Cuba relationship has been hovering on the brink of the post-Fidel era. There is little question that the tense and estranged relationship between the two countries is about to enter a new phase. The unresolved question is whether the future of U.S.-Cuban relations will look much different from the present. On December 2, Raúl Castro made a major speech at a celebration commemorating the 50th anniversary of Cuba’s Revolutionary Armed Forces, where he declared that “we take this opportunity once again to state that we are willing to resolve at the negotiating table the longstanding dispute between the United States and Cuba.” However, he signaled that Cuba would not be willing to compromise its communist political system, rejected any U.S. overtures to embrace democracy, and instead was planning to “wait patiently until the moment when common sense prevails in Washington power circles.” He has since repeated the offer to enter into a dialogue with the United States several times, most recently during the annual 26th of July address in 2007, where Fidel Castro was absent. The United States, for its part, has placed democracy and human rights concerns at the center of its Cuba policy, but has dismissed any speculation that a dialogue with the Cuban government will be utilized in pursuit of those concerns. In his 2007 State of the Union Address, President George W. Bush declared that “We will continue to speak out for the cause of freedom in places like Cuba, Belarus and Burma.” The U.S. embargo of Cuba has been accepted as an article of faith and is adamantly defended. U.S. Assistant Secretary of State for Latin America Tom Shannon dismissed Raúl Castro’s offers to negotiate as “nothing new” and emphasized the view that “the road to stability in Cuba runs through a successful transition to democracy.” The U.S. is now focusing on short term goals that would lead towards a political transition, such as freeing political prisoners, the development of trade unions and political parties, and creating a pathway towards elections. With or without Fidel Castro, it appears that the vast chasm between the U.S. and Cuba will show few signs of closing in the near term. More than one year has now passed since Fidel Castro stunned the world by handing over power to his brother and designated successor Raúl, but the U.S. and Cuba have evinced little interest or capacity to develop common ground. Indeed, the United States has been extraordinarily cautious in its public remarks, eschewing both a more aggressive or interventionist approach while avoiding any efforts to open up avenues for communication and dialogue with the provisional Cuban government. If anything, both sides have become trapped by wishful thinking that has inhibited broader policy changes. The U.S. wants Cuba to drop communism and embrace a democratic model while the Cuban government wants the U.S. to allow it to remain a communist state while treating it as a sovereign nation worthy of respect. But neither is ready to pursue the types of policies that the other claims to desire, so the standoff seems set to continue. The U.S. position has been complicated by the political imperative to prepare for the most desired scenario: the collapse of Cuban communism followed by a subsequent rapid transition to a democratic, pro-U.S. government in Cuba. In its public statements and high level governmental preparations, notably including the Commission for Assistance to a Free Cuba (CAFC) report initially released in 2004 and revised in 2006, President Bush’s Latin America team has embraced the assumption that democratic transition will take place in Cuba after Castro. This has left the U.S. government focused on how best to handle rapid dramatic democratic change in Cuba, while implicitly allowing the unfolding communist succession led by Raúl Castro to occur without hindrance. In addition, the more than four-year-old U.S. occupation of Iraq has left the Bush Administration with little appetite to try to force the Cuban government into economic collapse and risk a sudden upheaval. Taken as a whole, the policies of the Bush Administration suggest that that U.S. policy has become almost entirely rhetorical in nature, with few new tools or instruments being proposed to advance the presumed goal of democratizing Cuba. In Washington, the center of gravity in U.S.-Cuba policy is beginning to shift back to the U.S. Congress, where a bipartisan legislative group led by Rep. Jeff Flake (R-AZ) and Rep. Charlie Rangel (D-NY) has proposed a measure to lift the ban on travel to Cuba, while Rep. Bill Delahunt (D-MA) advocates a separate measure to allow Cuban-American family travel to Cuba. However, these measures have found it difficult to gain support in the Senate, where Cuban- American legislators like Sen. Mel Martinez (RFL) and Sen. Bob Menendez (D-NJ) hold significant sway. Even the House of Representatives has proven to be a difficult place to find much traction for changing Cuba policy one way or the other. While the newly Democratic leadership in the U.S. Congress is hardly sympathetic to the U.S. embargo, competing priorities and the remaining uncertainties about the shape of post-Fidel Cuba mean that any efforts to refashion U.S. policy are likely to take an incremental approach. Perhaps more importantly, the 2008 U.S. Presidential contest is fast approaching, and Florida will again be a key battleground state. In this context, the Cuban- American constituency will be well primed to work its magic on John McCain, Rudy Giuliani, Hillary Clinton, Barack Obama—or any other presidential contender. If a Cuban government led by Fidel or Raúl Castro outlasts Bush, then long-simmering tensions in Florida’s Cuban-American community will surely rise to the surface during the 2008 elections—and it will remain to be seen whether Miami’s new moderate voices have the influence to sway the community’s historic embrace of the U.S. embargo on Cuba. Indeed, after nearly fifty years of enmity, the war of attrition between the U.S. and Cuba appears poised to outlive Fidel Castro’s rule, and perhaps become his most durable legacy. Despite the official embargo, travel ban, and diplomatic non-recognition, there are significant areas of interaction, and even occasional cooperation between the United States and Cuba. From agricultural trade and humanitarian aid to U.S. attempts to speed regime change, the U.S. tradition of involvement on the island has continued long into the age of the embargo. U.S. restrictions on travel to Cuba have eased and tightened numerous times over the decades of the embargo. At this point, all Americans wishing to travel to Cuba must be licensed, a process administered through a small agency of the Treasury Department, as the stated purpose of the regulations is to deny income to the Castro regime. In general, the rules make a firm distinction between tourism and travel for specific, licensable purposes. Educational travel, research trips, travel to visit family on the island, and travel for religious, humanitarian, and some business purposes are, broadly speaking, licensable. The Bush Administration has been marked by a progressive tightening of travel rules. In March of 2003, new guidelines eliminated “people-to-people” exchange visits, short trips that were not affiliated with any educational institution, and which were allowed under a 1999 decision by the Administration of President Bill Clinton. Following the May release of the 2004 CAFC report, the Administration further restricted travel for Cuban-Americans with family on the island and students in exchange programs. Finally, in 2005, in response to what it called abuses of the licenses by some groups, the Administration tightened the requirements for licensing of religious organizations (Sullivan, 2007). Estimates of the number of U.S. visitors to Cuba are always inexact because of the number of Americans who visit illegally, often traveling via Canada or Mexico. However, the travel restrictions imposed in 2003 and 2004 did have an appreciable impact on the number of Americans visiting the island, according to Cuban government figures. In both years, Cuban Americans represented about half of the total visitors. From a 2003 total of 200,859, 115,050 of whom were Cuban-American, the number of U.S. visitors to the island in 2004 dropped to 108,172, including 57,145 Cuban Americans. The change in total U.S. visitors from 2004 to 2005 was far less dramatic, dropping only to approximately 101,000 (Sullivan, 2007). Remittances are an equally regulated interaction between the United States and Cuba. Prior to June of 2004, Americans could send money to any household in Cuba that did not include a high-ranking member of the Cuban government or the Communist Party. Since the 2004 tightening of the embargo, remittances are permitted only to the immediate family members of the remitter, and they are limited to $300 per quarter. Significant restrictions also apply when sending packages to Cuba. Parcels with retail values of $200 worth of food, medical supplies, other necessities, and radio equipment, may be sent once a month to individuals or non-government organizations. Despite the new regulations, sending remittances is still a fairly common practice among Cuban- Americans. In the 2007 Florida International University poll of the Miami Cuban-American community, 58.3% of respondents said that they or relatives in the city sent money to relatives in Cuba (FIU Cuba Poll, 2007). Cuban-Americans are more likely to send money through informal channels than are remitters to other countries in the region, largely because the cost of sending money to Cuba is significantly higher. In 2001, a full 46% of Cuban remittances arrived through mulas or viajeros. This picture is gradually changing as Cuba’s financial sector modernizes. Estimates of total remittance flows are quite controversial. The 2004 CAFC report noted estimates ranging from $400 million to $1 billion annually in remittance flows into the country (Sullivan, 2007). The Inter-American Development Bank puts Cuba’s approximate remittance receipts at $855 million in 2004 and $900 million, or 2.3% of the Cuban GDP, in 2005 (González-Corzo and Larson, 2006). However, some observers have charged that these high estimates have no basis in objective analysis and conceal the Castro government’s true source of hard currency: money laundering and drug trafficking. This conclusion is largely drawn from studies of remittancesending behavior among Cuban-Americans and the known or reputed connections between the Castro brothers and a number of convicted drug smugglers (Betancourt, 2000). During the last year in office of President Bill Clinton, the U.S. Congress passed a minor trade amendment with huge repercussions for the U.S.-Cuba relationship. The Trade Sanctions Reform and Export Enhancement Act, signed into law in October 2000, was an important victory for the American farm lobby. The bill authorized the sale of U.S. agricultural products to Cuba on an all-cash basis. It was clearly the most significant legislative initiative passed on Cuba since the 1996 Helms-Burton bill. Since the Cuban government began buying food from the United States in 2001, Cuba has paid more than $1.5 billion to U.S. companies. According to official Cuban import firm Alimport, the country has made contact with more than 4,000 firms from 45 states, resulting in deals with 162 different companies. Despite the initial explosive growth, U.S. exports to Cuba declined from 2004 to 2005 and also from 2005 to 2006. Explanations for this decline include stricter U.S. regulations, financial support Cuba receives from Venezuela and China, and Cuban success in finding substitute exporters. Another significant factor is the efforts of the Cuban government to force stronger lobbying on Cuba’s behalf by cutting orders from U.S. companies (Bussey, 2007). Even with the recent declines, though, Cuba is 34th among the 227 export markets for U.S. agricultural goods (2006 Export Statistics for Cuba). The top agricultural exports to Cuba include wheat, chicken, corn, rice, soybean products, peas, beans, pork, and powdered milk. Other exports of note are colas, mayonnaise, hot sauce, candy bars, and cows (2006 Export Statistics for Cuba). The primary problem U.S. exporters face in selling to the Cuban market is restrictions on financing. Alimport cannot directly wire money to a U.S. firm’s bank, and, based on 2004 regulations, all payments must be received before the goods can be shipped. So, letters of credit must be cleared through four banks—one in Cuba, one in Europe, the European bank’s correspondent bank in the U.S., and finally the exporter’s bank. While the shipment can leave as soon as the foreign bank confirms that payment was received from Cuba, if any errors or changes in the paperwork occur, all four letters of credit must be rewritten (Bussey, 2007). In the U.S. Congress, the farm lobby has now emerged as the most influential new voice in current policymaking. It is led by several senior western Republicans who are being pressed by their constituencies to seek new markets. In Cold War days, these legislators would have supported anti-Castro initiatives as an easy way to accrue political capital within the party at little personal cost. The end of the Soviet Union and the beginning of a new farming crisis in the 1990s has changed all that, allowing a nascent coalition of liberal Democrats and western conservatives to pump new life into congressional momentum to repeal the Cuban embargo. Support for these initiatives among the rank-and-file has faced strong opposition from Republican leadership, especially in the House. Still, evidence suggests that hardliners in the Republican leadership are increasingly isolated from the congressional mainstream. Nor is congressional pressure against the embargo easing. Now that agricultural trade with Cuba is allowed and progressing nicely, the prohibition on financing of food sales to Cuba has become one major focus of lobbyists’ efforts. The American Farm Bureau Federation is seeking exemption of U.S. products from all existing embargoes and sanctions, which are estimated to cost U.S. farmers 14 percent of the export market for rice, 10 percent for wheat, 5 percent for vegetable oil and barley, and 4 percent of foreign corn sales. The opening of agricultural trade also led some agricultural lobbies to sponsor trips to Cuba for their Congressional representatives, in hopes of securing trade deals. USA Rice sent three members of Congress to Cuba in spring of 2001, and single-member delegations sponsored by the Greater Des Moines (Iowa) Business Partnership, the Indiana Farm Bureau, and the Texas Trade Delegation traveled there between 2003 and 2005. A number of trips sponsored by various research institutes have also focused on agricultural trade issues. Similarly, the largest recent congressional delegation to Cuba, which sent 10 members in December of 2006, included three Republicans from states with large agricultural interests. Congressmen are not the only elected U.S. officials traveling on delegations to Cuba. The growing agricultural trade has spurred a number of trade missions by state governors as well. Seven sitting U.S. governors have traveled to Cuba since Fidel Castro took power in 1959. Former Governor George Ryan of Illinois first broke the taboo six years ago, and he has since been followed by Jesse Ventura of Minnesota, and the top state officials from Louisiana, Nebraska, North Dakota, Maine, and Idaho. These state leaders emphasized increasing trade ties, but Cuba is also seeking stronger political relations. In March 2005, Louisiana Governor Kathleen Blanco returned from Cuba with $15 million in signed trade deals and a pledge of further cooperation. When her state was devastated by Hurricane Katrina in September of 2005, the Cuban government offered to send 1,600 medical personnel to assist in rescue efforts. (The U.S. State Department rebuffed the offer.) Few governors have been willing to discuss crucial issues of democracy and human rights with the Castro government. This has been a missed opportunity. In 2003, Iowa Governor Tom Vilsack canceled his planned trip when the Cuban government arrested 75 opposition leaders and independent journalists and sentenced them to long prison terms. The two governors leading delegations to Cuba in spring of 2007 stuck to the general program of trade talks, official delegations, and, at least publicly, silence on human rights issues. Both Governor Dave Heineman of Nebraska and Governor “Butch” Otter of Idaho are Republican military veterans in conservative states with important agricultural sectors. Most interestingly, though, both had met Fidel Castro on previous trips to Cuba. Much of Nebraska’s Governor Heineman’s political platform is based on opening markets for Nebraskan agricultural producers. In addition to brokering two previous $30 million trade deals with Cuba, the state recently opened a trade promotion office in Tokyo. Before the governor’s spring 2007 trip, the state of Nebraska had actually sold $38.9 million worth of agricultural products to Cuba. This most recent trip, the governor’s third, was focused on helping to negotiate the contracts with individual businesses to implement one of the previously signed $30 million deals. Governor Otter of Idaho has a similar focus on agricultural issues, as he made his career in the sector before entering politics. His trip to Cuba was his first trade mission as governor, but Otter had visited the island three times in the past few years while serving as a US Congressman. On a 2004 visit, he helped to negotiate a $10 million trade agreement. However, the deal ultimately only resulted in about $23,000 in sales, so Cuba is still a very new market for Idaho exporters. Governor Otter came back from his April trip to Cuba with new contacts, nurtured relationships and, perhaps most importantly, an agreement to ship more than $100,000 worth of pork legs. U.S. private citizens and agricultural businesses are important, as are the elected U.S. congressmen and governors that these dealings often involve, but certainly not the only source of dialogue and engagement between the United States and Cuba. For all the official hostility, the two countries are occasionally forced to interact at the federal level, whether on the critical security issues which naturally arise from close proximity or the administration of orderly migration. These interactions range from the highly secret, such as migration negotiations only announced after an agreement is concluded, to the extremely public, like the continual war of words that plays out in the media in both Cuba and the United States. In Cuba, that media includes Radio and TV Martí, U.S. government-run stations which beam U.S. political positions, news, and other fare onto the island. While the countries may be bad neighbors, they are neighbors nonetheless, and their web of interconnection can be surprisingly intricate. Military to military contacts between the U.S. and Cuba is starkly limited by current policies, to the displeasure of a number of military commanders. As the countries do not have official diplomatic relations, U.S. active military personnel at high levels do not have formal talks with their counterparts, but some dialogue and cooperation does take place. Melanie Ziegler, author of a recent book on U.S.-Cuba security collaboration, makes a convincing argument that what contact exists can be classified as “confidence building measures”: limited cooperation on issues of high politics aimed at reducing identifiable threats through quiet diplomacy (Ziegler, 2004). In this spirit of reducing threats, the most consistent official line of communication between the two countries has been the monthly low-level talks between American troops at Guantanamo Naval Base and their Cuban counterparts, in place since 1995 (Graham, 2006). The talks began in response to the migration crisis of 1994–1995, and were initially focused on the day-today issues of housing 30,000 refugees on the base, but they have continued and expanded in subsequent years (Ziegler, 2004). Over breakfast, the military officials generally discuss base administrative matters and sports, though a few issues of substance have also been broached in the meetings, such as the Cuban offer to send doctors to help the victims of Hurricane Katrina (Williams, 2006). The conversations are intended to prevent misunderstandings and ensure the smooth operation of the base, so they are local and practical in nature, not addressing matters of international politics or official policies. Drug interdiction and disaster preparation are two higher-level security threats on which the United States and Cuba might reasonably be expected to cooperate. However, efforts in these arenas have met decidedly mixed results in recent years. The two sides coordinate rather well on hurricanes. Under pressure from forecasters in both countries, Cuba and the United States have been cooperating in tracking storms for 30 years. The Cuban government even allows U.S. planes to fly into its airspace on occasion in order to better monitor developing hurricanes. While scientists in both countries view the cooperation as routine and unsurprising, the fact remains that it takes a threat as severe and non-political as a devastating hurricane to induce the two sides to work together officially on a security issue (Wides- Munoz, 2006). On the other hand, periodic attempts to coordinate drug interdiction programs have largely failed due to pressures from U.S. anti-Castro groups. The Clinton Administration held talks with Havana on the possibility of stationing anti-drug personnel and sophisticated equipment in Cuba, but no sustained cooperation ever materialized. In the face of the general reluctance to coordinate on security, a number of current and retired U.S. generals have both visited the island and commented on the problems of U.S. policies (Baker, 2007). The first of these, General John Sheehan, actually initiated the Guantanamo talks when he was the head of U.S. Atlantic Command, the division of the U.S. military that then oversaw Caribbean operations. In 1998, the newly-retired Sheehan traveled to Cuba to inspect military facilities and biological laboratories on the island. Upon his return, he gave a press conference to explain his view that the Cuban military no longer posed a threat to the United States and that there was no evidence that the Cubans were producing biological weapons, urging policymakers to normalize relations with Cuba. Sheehan has continued to travel periodically to Cuba, most recently in March of 2007 with the World Security Institute, the re-organized Washington organization that used to be the Center for Defense Information (CDI). A number of other trips by retired generals were sponsored by CDI, which advocated military cooperation between Cuba and the United States. In 2001, a CDI delegation focused on drug interdiction efforts and other possibilities for concrete cooperation included retired General Charles Wilhelm. Wilhelm was a former commander of Southcom, the U.S. military command which now has responsibility for the entirety of Latin America. After his retirement, he began to advocate closer military ties between the U.S. and Cuba, ultimately traveling there on five separate occasions. In 2002, on Wilhelm’s second trip with CDI to Cuba, he was accompanied by retired General Barry McCaffrey, the drug czar under the Administration of President Bill Clinton and yet another former Southcom commander. The post-September 11th trip was focused on terrorism as well as the drug trade, especially the connections between the two. Upon their return, Wilhelm proclaimed that Cuba posed no threat to the United States and Mc- Caffrey called it “an island of resistance to drug traffic” (Baker, 2002). Both advocated greater cooperation on security issues between the countries. Late 2002 also saw the launch of a CDI initiative to monitor the perceived bioweapons threat from Cuba. After Under Secretary of State John Bolton alleged that the Cubans were producing and distributing bioweapons, CDI was able to send a team of inspectors to the island. Their conclusions did not completely disprove but certainly undermined Bolton’s allegations, and the initial trip led to several follow- up visits where U.S. and Cuban scientists discussed opportunities for future cooperation (Baker, 2007). While the concrete outcomes of talks between the retired generals and Cuban officials are hard to measure, the trips do seem to serve several purposes. First, they have opened a new front in the U.S. domestic debate on Cuba policy. Since the threat of Cuba as a member of the Communist bloc perished with the Cold War, more urgent and everyday security threats have taken precedence in the eyes of these U.S. military commanders (Ziegler, 2004). Their public advocacy for increased cooperation offers a national security rationale for relaxation of tensions which is difficult to counter on the pure ideological grounds which usually dominate Cuba policy discussions. Second, and more importantly in the Cuban domestic context, in the absence of official military to military talks, these delegations serve to communicate the concerns and counter the fears of the two sides (Baker, 2007). Upon their return to the United States, the visiting generals pass along the substance of their conversations to their active-duty colleagues. They are also able to credibly reassure their Cuban counterparts that the United States has no plans to invade the island, despite hostile rhetoric from the U.S. executive branch which periodically spooks the Cubans. Underpinning that credibility is the fact that the generals who are frequent visitors to Cuba have built a good rapport with their opposite numbers, based on shared identities and concerns as military men (Baker, 2007). In 2006 and 2007, the American political scene saw some of the first critiques from active duty generals of the U.S. reluctance to engage with Cuba on security threats. During a briefing for reporters on the occasion of the end of his term as Southcom commander, General Bantz J. Craddock said that he thought Cuba policy “needs to be re-looked” and that all of U.S. laws regarding Cuba, not just the ban on military contacts, should be reviewed “stem to stern” (Bachelet, 2006). In response, Craddock’s successor, Vice Admiral James G. Stavridis, was asked during his confirmation hearings about his position on Cuba policy. Stavridis offered a bit of a political hedge without rejecting Craddock’s views, telling the Senators in his response to advance questions that he would “address the specific situation regarding military engagement with Cuba” and that “U.S. policy toward Cuba, like all policy, should be periodically reviewed and reassessed to ensure it is relevant to the changing environment.” Dissatisfaction within the U.S. military about official prohibitions on coordination with Cuba may become a more important factor in policymaking in the years to come. As it stands now, contacts are limited but substantive and important. One channel of communication between the U.S. and Cuba which recently closed was the semi-annual migration talks. After a crisis of uncontrolled migration in 1994, the Clinton Administration negotiated a migration accord with the Castro regime under which the United States would issue at least 20,000 visas to Cubans wishing to immigrate each year. For its part, Cuba would discourage its citizens from attempting illegal migration by way of the Florida Straits or the Guantanamo Bay Naval Base. The semi-annual implementation talks were held until January of 2004, when the Bush Administration unilaterally suspended them, citing Cuban unwillingness to discuss key issues. Among these points of contention were the Cuban government’s alleged refusal to: grant exit permits to all Cubans who received visas, cooperate in the administration of a visa lottery, give a deep-water port to the U.S. Coast Guard for use in repatriating illegal migrants, restore U.S. access to repatriated Cubans to monitor their treatment, and accept Cubans who the U.S. wished to deport. The Cuban side decried the move, saying they were willing to negotiate on all of the issues, though they would not accept every U.S. demand. As it now stands, U.S. migration policy with regard to Cuba operates on the “wet foot-dry foot” principle, that is, Cubans picked up at sea are generally returned to Cuba, while those who make land in the U.S. can usually stay. The 20,000 visas agreed to under the 1994 accords are still granted annually, but there has been no sign that the talks will resume. In the absence of official diplomatic ties, much of the high-level dialogue between the United States and Cuba is carried on through official statements and in the press of both countries. This talk is generally polarizing, especially when it is designed for the consumption of domestic audiences. For example, upon the release of the second CAFC report in July 2006, U.S. officials including Secretary of State Condoleezza Rice, Cuba Transition Coordinator Caleb McCarry, and President Bush himself all issued statements extolling the $80 million to be allocated for Cuban efforts at building democracy, largely grants to groups which oppose the Castro government. Ricardo Alarcón, the President of the Cuban National Assembly and Cuban authority on all things American, responded to the same report by suggesting that its classified section probably included plans for assassinations and the invasion of the island. Fidel Castro’s late summer hospitalization and surgery provoked a flurry of statements and briefings from both sides. The most significant of these was probably Raúl Castro’s assertion in an interview with the Cuban paper Granma on August 18th that “siempre hemos estado dispuestos a normalizar las relaciones en un plano de igualdad.” The idea of negotiations with Raúl Castro was flatly rejected in Washington. Official statements from the Bush Administration began with repeated declarations by a variety of officials that Cubans should not leave the island, that the United States supported Cubans in their quest for democracy, and that the U.S. had no plans to invade Cuba. On August 3rd, President Bush urged Cubans to work for democratic change, saying that the U.S. government would “take note of those, in the current Cuban regime, who obstruct your desire for a free Cuba,” a statement that drew condemnation from Raúl Castro in the same August 18th interview where he proclaimed a desire for normalization. In a Bush Administration proposal announced by U.S. Commerce Secretary Carlos Gutiérrez, who is Cuban-American, the U.S. government asked that Cuba allow its people to vote on whether or not they wanted Raúl Castro as their leader. A Bush Administration talking point that persisted through the end of the year and well into 2007 was the idea that a transition to democracy, not a succession, should occur at the end of the Castro era in Cuba. The general Cuban response to U.S. statements on transitions and democratization was to emphasize the hostility of Washington and the threat of invasion. One rhetorical tactic that appeared again and again was the comparison of U.S. policies toward Cuba with the war in Iraq. Cuban Foreign Minister Felipe Pérez Roque equated Cuba Transition Coordinator McCarry to Paul Bremer, the post-invasion Administrator of occupied Iraq. Similarly, National Assembly President Alarcón equated the CAFC report’s calls for transition to the U.S. policy of regime change in Iraq. President Bush’s call for change in Cuba was continually dismissed as code for an invasion plan. To that perceived threat, Alarcón said in an interview with a Venezuelan TV station that “cualquier intento de Estados Unidos contra la soberanía de Cuba, se va a convertir en un infierno.” Raúl Castro noted that the Cuban armed forces were mobilized against the threat, and the Cuban military held a large demonstration as a show of strength. The on-the-ground presence of the United States in Cuba is the U.S. Interests Section. While it operates out of the building that was previously the U.S. Embassy, the Interests Section is officially a department of the Swiss Embassy to Cuba. The various personalities of the Chiefs of the Interests Section have had an enormous influence on its specific policies in recent years. None has been popular with the Castro government. Common to the operations under all Chiefs are general U.S. consular operations, including a refugee processing program unique to Cuba; meetings with Cuban dissident leaders; and a space to view U.S. media, such as the otherwise-blocked TV Martí and various publications distributed by the U.S. government. In more recent years, the Interests Section has also opened an area in which visitors can use computers with Internet access. Actually reaching the Interests Section can be difficult for Cubans, as a cordon of Cuban police guards the building; the adjoining area is called the “Anti-Imperialism Plaza” and is used for periodic demonstrations against both U.S. policies and Interests Section initiatives. Ambassador Vicki Huddleston was Interests Section Chief from 1999–2002, during the era of the popular “people-to-people” exchange programs of U.S. visitors. She remains an avid supporter of such exchanges, explaining that they were resulting in real contacts with ordinary Cubans and the spread of new ideas. The biggest controversy of Huddleston’s posting in Cuba was over the distribution of 500 radios to Cuban activists. The Castro government charged that the radios were distributed to allow Cubans to listen to U.S. government broadcasts. Therefore, their distribution was subversive and a violation of the Vienna Convention. James Cason, now the U.S. Ambassador to Paraguay, was the most controversial of the recent Interests Section Chiefs. In the fall of 2004, he built a model prison cell in his backyard to draw attention to the plight of political prisoners in Cuba. Later that year, the Interests Section Christmas decorations included a large lighted “75,” referencing the 75 dissidents jailed in a 2003 crackdown. After Cason dismissed the demands of the Cuban government to take down the sign, the Cubans put up billboards bearing swastikas and the famous photographs of detainee abuse at Abu Ghraib prison in Iraq with a “Made in the U.S.A.” stamp. The government also organized student demonstration against the Interests Section. Since late 2005, the post of Chief has been held by career diplomat Michael Parmly, who was initially expected to bring a more conciliatory tone to the position. In December of that year, he first drew Castro’s displeasure by likening government supporters who harass dissidents to Nazi Brownshirts or Ku Klux Klan members. Then, in what became one of the strangest feuds between the countries in recent years, in January 2006 Parmly’s Interests Section mounted a five-foot ticker across 25 windows of the building to beam news and messages of freedom to the Cuban people. The Castro government’s first response was erecting billboards criticizing the United States for supporting anti-Castro terrorists. Then, the Cubans put up a number of tall flagpoles flying black flags to block the ticker from view. Finally, power to the mission was cut for a week in June, prompting accusations by the Interests Section of harassment and outraged denials by the Cubans, who claimed that the outage was the simple result of a damaged power line. Radio and TV Martí are U.S. government broadcasting tools intended to provide independent information and spark democratic change in Cuba. The Cuban government has protested them for years as violations of international law, and they also spark significant controversy at home. Radio Martí began broadcasting in 1985, largely due to the efforts of Jorge Mas Canosa, a prominent Cuban American leader who founded and for years led the Cuban American National Foundation (CANF). TV Martí was added in 1990, but the Cuban government blocked its signal for years, although recent technological steps have been taken to overcome this. In 1996, both stations moved from Washington to Miami, where they are supervised by the Office of Cuba Broadcasting (OCB), an agency under the Broadcast Board of Governors (BBG), the federal agency responsible for all US government broadcasting abroad. Programming on both stations is a mix of news, commentary, and entertainment programming, much of which also has some ideological content. Cuban-Americans largely run and staff the two stations. The impact and penetration of U.S. broadcasting in Cuba is difficult to measure, but several surveys have estimated the audience share, which appears to be declining. In 1998, Radio Martí’s own estimate put its audience at 9 percent of the Cuban adult population. In 2005 the BBG put listenership at just 1.2 percent. For years, TV Martí has essentially no audience because of the successful blocking efforts, with perhaps one in a thousand Cubans seeing it in any given week. In the past, concerns have been raised about the station’s difficulties in attracting listeners. Operating both stations is fairly expensive, at approximately $37 million annually. One especially controversial component of the budget is the $10 million appropriation for an airplane to broadcast TV Martí, despite its continued ineffectiveness in beating Cuban blocking of the signal. Beyond the expense, the Martí stations have recently drawn domestic criticism for their relationship with the U.S. domestic media. The first such scandal was the revelation that the OCB was employing South Florida private sector journalists, some of whom were simultaneously reporting stories on the stations for U.S. media outlets and taking money from them to produce for the Cuban market. Several of the journalists were fired from their non-government jobs for the apparent conflict of interest. Then, the OCB began providing TV Martí programming to a Miami Spanish-language television station which is received by satellite dishes in Cuba. The effort’s legality is questionable, as U.S. law has long forbidden the dissemination of U.S. government broadcasting intended for foreign audiences in the domestic market. The Castro government renewed its objection to the stations after the announcement of the new broadcasts, advising the Cuban public that it would crack down on the use of satellite dishes, which are illegal in Cuba. Listening to Radio Martí has also proven dangerous for Cubans in the past. On several occasions, Cubans arrested for immigration violations have claimed that comments they heard on the station gave them the impression that they could leave Cuba legally. In one instance in 2002, a group of thirteen Cuban migrants landed in the U.S. Virgin Islands. Eight of them subsequently claimed that Radio Martí broadcasts said that they could immigrate to the United States legally if they made the shore of the U.S. territory. A more spectacular incident, also in 2002, saw 23 men crash a stolen bus through the gates of the Mexican Embassy. The group of Cubans said they rushed the embassy in response to the Mexican Foreign Minister’s assertion, played a number of times on Radio Martí, that “las puertas de la embajada de México en la isla están abiertas a todos los ciudadanos cubanos.” Advocates for Radio and TV Martí argue that the quality of the programming has improved and that the stations are playing a crucial role in getting information about the outside world to Cuban listeners. One of the most controversial areas of U.S. involvement with Cuba is the “democracy building” effort, initiated under the Clinton Administration but broadened under Bush, which indirectly funds dissidents on the island. The government has been doling out similar aid through USAID since 1996 (“Profile of the USAID Cuba Program 2001”), but the implementation of the CAFC reports came with a budgetary windfall and much increased public attention and scrutiny toward the programs (“USAID/Cuba Operational Plan FY 2006”). Due to a host of bureaucratic and political concerns, funding for democracy building efforts is funneled through U.S.-based NGOs, most of which are located in either Miami or Washington, DC, and many of which are run by members of the hard-line faction of the Cuban- American community. The democracy building grants are directed toward providing objective information, building an independent press on the island, and supporting dissidents, both in funding their activities and personally supporting them and their families through the hardships imposed upon them by the Castro regime and its agents. The various problems and logistical difficulties associated with the democracy building effort were enumerated in a recent Government Accountability Office report. Since regulations prevent directly sending money to dissident groups, largely for fear of making them appear to be agents of the United States, grantees must ship physical goods to the island. Shipping costs eat up an enormous portion of the funds, and some items are lost or confiscated in transit. Of more concern, some of the money has been used for questionable purposes, like luxury items for the families of dissidents (Regan, 2006). The GAO report prompted a number of contradictory responses from interested parties both on and off the island. Cuban- Americans are, by and large, supportive of the program, which does provide a great deal of money to Miami organizations. Some prominent dissidents have also called for its continuation despite the logistical challenges, saying it aids their efforts. Others, however, refuse to take any of the money, saying it co-opts them in the eyes of potential Cuban supporters (Snow, 2006). The U.S. private and non-governmental sector is very involved in the issue of Cuba policy, as well as in a number of academic and humanitarian efforts on the island itself. Broadly speaking, private sector involvement can be divided into human rights and humanitarian organizations, business interests, research organizations, universities, religious groups, cultural and exchange programs, and advocacy groups, though there is significant overlap among the categories. The gradually tightened restrictions on travel introduced between 2003 and 2005 have significantly curtailed the work of some of these organizations and even sparked the creation of new lobbying groups. Several major NGOs which are either based in the United States or have a significant presence here work on human rights and humanitarian issues in Cuba. Amnesty International, Human Rights Watch (HRW), and Freedom House all publish reports detailing the abuses of the Cuban regime, with Amnesty and HRW also focusing on the hardships imposed by the U.S. embargo. Oxfam America supports a number of Cuban NGOs with financial grants, and a smaller organization, Disarm Cuban Education Fund, sends medicines, supplies, and medical specialists to Cuba to counter the shortages caused by the U.S. embargo. Three professional organizations, a consultancy, and a monthly newspaper function in support of the limited trade relationship between Cuba and the United States. The U.S.-Cuba Trade and Economic Council is an explicitly non-political organization which provides information to businesses on trading with Cuba. The U.S.-Cuba Trade Association takes an advocacy approach, pushing for continued and expanded legal trade with Cuba. It is affiliated with USA-Engage, an anti-sanctions organization. The President of the U.S.-Cuba Trade Association also runs Alamar Associates, a consultancy which helps clients set up contracts in Cuba. Another professional organization in the field is the Association for the Study of the Cuban Economy, which studies the transition to a free market in Cuba. Finally, Cuba News is a monthly newspaper on issues of business and policy in Cuba. 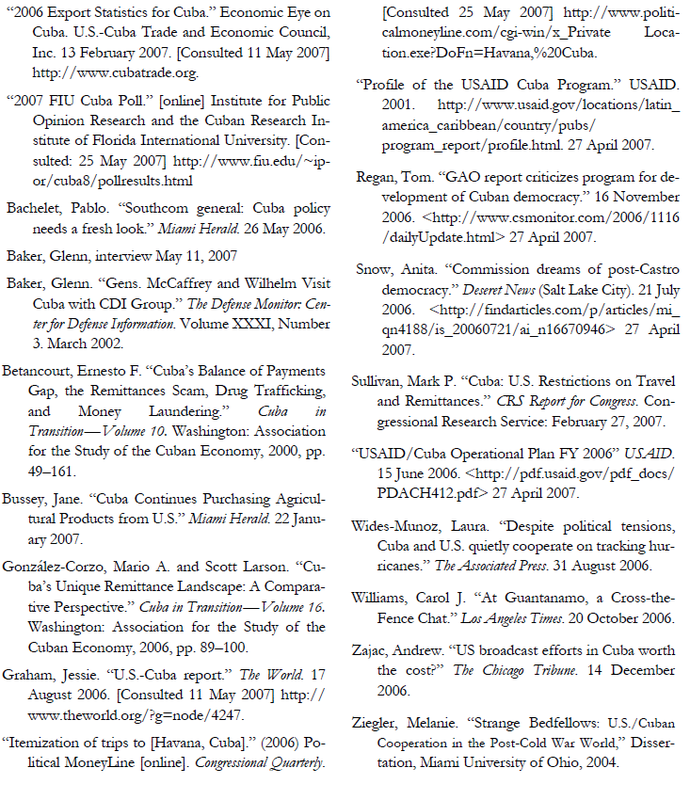 Numerous research organizations publish periodic reports on Cuba, most of which condemn the Castro regime but also criticize current U.S. policies. On the left of the mainstream spectrum of approaches to Cuba policy are the Latin America Working Group, the Center for International Policy (CIP), and the Washington Office on Latin America. All three organizations take an activist approach to Cuba policy, encouraging their readers to lobby Congress for changes. CIP scholar Wayne Smith was the U.S. Interests Section Chief under Carter, and he is especially involved in the campaign to lift the travel ban. The Council on Foreign Relations and the Inter-American Dialogue have both issued reports critical of U.S. policy and favoring reducing the barriers to travel, information, and exchange between the U.S. and Cuba, although the trade and investment embargo is treated with greater caution. Two generally libertarian organizations which take also take fairly critical positions on Cuba policy are the Cato Institute and the Lexington Institute. All of the centrist organizations criticize U.S. policies as misguided and ineffective. In Washington, the conservative position is occupied by the Heritage Foundation and the American Enterprise Institute. These two organizations are most focused on condemning the Castro regime and generally support current U.S. policies. Many of the universities with Cuba-related programs are in South Florida, though a few are scattered throughout the country. The two most important of the university institutes are in Miami: Florida International University’s (FIU) Cuban Research Institute and the University of Miami’s Institute for Cuban and Cuban-American Studies. FIU organizes exchanges with Cuban academics, hosts a major conference every 18 months, and conducts an important ongoing poll of the Cuban American community. The University of Miami is the home to the Cuba Transition Project and the online journal Cuban Affairs. Four other general Cuba studies programs are located at Harvard University, the City University of New York, the New School and Tulane University. More specialized centers include the Center for Cuban Business Studies at Ohio Northern University, the International Agricultural Trade and Development Center at the University of Florida and the web-based Rule of Law and Cuba at Florida State University. Johns Hopkins University operates the Cuba Exchange Program, which provides grants to conduct research in Cuba, holds conferences in both countries and brings Cubans to the United States to give classes and conduct research. The only universities still offering undergraduate study abroad programs in Cuba are the State University of New York, Oswego, the University of Buffalo, and the University of North Carolina, all of which have partnerships with Universidad de la Habana. Many religious groups which travel to Cuba were dismayed by the 2005 tightening of regulations surrounding the licensing of their trips. Some have even been prosecuted for allegedly violating the terms of their licenses. Christian denominations with interests in Cuba tend to support and visit partner congregations and actively oppose the embargo, including the U.S. restrictions on travel and humanitarian aid. The umbrella group National Council of Churches (NCC), and its relief and development section, Church World Service (CWS), represent 35 different Christian denominations. They lead periodic religious and humanitarian delegations to Cuba. The larger denominations involved in this effort include the Presbyterian Church, the United Methodist Church, and the jointly-organized United Church of Christ/Christian Church (Disciples of Christ). The Alliance of Baptists, a small, liberal denomination also under the NCC umbrella, has formally challenged a fine levied by the Treasury Department for alleged violations of the terms of its travel license. The American Friends Service Committee, a Quaker organization which opposes the U.S. embargo, helped to organize a major conference on developing Cuban civil society and connections with regional NGOs and has continued to provide technical and professional exchanges and education. Jewish organizations have also, more recently, become involved in Cuba. At least five different Jewish groups provide humanitarian and religious aid to Cuba, largely with the stated purpose of supporting the resurgence of Jewish life on the island. The Jewish groups are far less involved than their Christian counterparts with any political agenda. Also active are a number of U.S.-Cuba cultural and exchange programs and organizations. Global Exchange and the Center for Cuban Studies oppose the travel ban organize trips for licensed Americans to Cuba. Fundación Amistad and the American Friends of the Ludwig Foundation are more focused on mutual exchanges. A number of other, similar organizations suspended their trips when the “people-to-people” exchange program was ended in 2002. Several U.S.-based organizations also promote and preserve Cuban culture, including Art-Havana, which is focused on contemporary Cuban art; Cuban Cinema Classics, which distributes Cuban documentaries with English subtitles; the Cuban Cultural Center of New York; and the Cuban/Latino Theater Archive at the University of Miami. La Habana Elegante is a Cuban literary e-magazine published in the U.S., and the Havana Film Festival in New York is an annual showing of the best of current Cuban cinema. U.S. advocacy groups focused on Cuba range across the ideological spectrum, from militant anti-Castro exiles to American supporters of the Castro regime. Many advocacy groups came out of the Cuban- American community, though a number promote other interests in the island. The traditional anti-Castro and pro-embargo advocacy is maintained by a number of groups in the community. Several of these also engage in humanitarian efforts or support for dissidents on the island. Some of the most prominent Cuba-focused NGOs in the Cuban-American community include The Center for a Free Cuba, the Cuban Democratic Directorate, The Free Cuba Foundation, The Cuban Liberty Council, and the Cuban American National Foundation (CANF). Many groups have overlapping memberships while others are operate with a distinct group of individuals. CANF itself, once the bastion of unreconstructed veterans of the Bay of Pigs operation and fierce opposition to Castro, has significantly moderated in recent years. In the aftermath the Elian González affair of 2000, some Cuban-American leaders were shocked by the bad image their community had in the eyes of the general American public. The result was a degree of restraint in both their approach to Cuba policy and their rhetoric on the issue. CANF, while remaining anti-Castro and largely pro-embargo, has promoted such moderate measures as liberalization of the current restrictions on remittances and expanded family travel. Another organization, the Cuba Study Group, was created directly in response to the Elian González affair. While its membership of prominent Cuban Americans includes some former hardliners, the Study Group promotes pragmatic alternatives to current U.S. policies. The Cuban-American community is also represented by a few groups that actively oppose U.S. policies. Several of these work primarily to ease restrictions on family travel and remittances to Cuba. The Cuban American Commission for Family Rights was formed in opposition to the 2004 tightening of travel and remittance regulations. An older organization, the Cuban American Alliance, is dedicated to exposing the problems imposed by U.S. Cuba policies. It primarily works to end all restrictions on travel to Cuba. The Emergency Network of Cuban American Scholars and Artists for Change in U.S.-Cuba Policy opposes restrictions on family and academic travel, but also opposes the embargo itself, and is working to end the image of a monolithic, hard-line Cuban- American community. In 2007, the U.S.-Cuba relationship remains contentious, sometimes embittered, and certainly unique in the context of the countries’ respective foreign policies. But, contrary to popular belief, it is not frozen. A wide range of academic, humanitarian, and advocacy groups continue to remain engaged with their counterparts in Cuba. The U.S. government continues to have the largest foreign diplomatic presence on Cuba and U.S. officials engage in dialogue regularly on discrete, non-political issues such a hurricane forecasting, managing migrants flows in the Florida straits, and maintaining the fence line at Guantanamo Bay. Elected U.S. officials from the U.S. Congress and several state governments travel to Cuba regularly and meet with governmental officials. New agricultural trade rules have transformed Cuba into a small but significant trading partner. The U.S. also engages in a number of activities intended to undermine the Cuban government, including U.S.-funded programs to engage with Cuba opposition leaders and broadcast radio and television into Cuba that continue unabated. Against the background of this activity, it still has to be said that the prospects for bilateral diplomatic talks appear to be stalled. It is possible that Raúl Castro’s offer to engage in dialogue is sincere, or it may be a false statement that he is making for his own reasons. Whatever the case, the Raúl Castro government is not moving towards the political and economic opening that the U.S. has set forth as a precondition to engaging with the Cuban government. Thus, the 48–year old stalemate between the two governments seems set to endure for some time longer, irrespective of whether Fidel Castro lives to see the next U.S. presidential election in November 2008. 1. This essay is a draft chapter for a forthcoming book on Cuba’s international relations to be published in Spain.